Guy: This week welcome to the show Steph Lowe. She is a sports nutritionist, triathlete and cashew butter addict from Melbourne, Victoria. She teachs how easy real food living and performance can be. She has been gluten free for nine years now, and literally because it makes her happy. She has an undergraduate degree in Sport and Exercise Science (James Cook University, Townsville). She has a post graduate degree in Human Nutrition (Deakin University, Melbourne) and is one subject away from completing my Masters. She is a long course triathlete currently taking a break from racing to reset the body and mind. Her biggest piece of advice is to dive straight in – study, blog, create, share and enjoy the journey. Do what you love, love what you do. Use Snapchat? Follow me at: GuyL180 or Click Here. What is metabolic efficiency and what is it important for everyone, from the sedentary to elite athlete? From a fuelling and recovery perspective, what adjustments would you make from say; a high intensity sport like Crossfit to a endurance athlete? What are the common mistakes people make? Meredith Loring: Probably the Most Amazing Example Of Endurance Athleticism You’ll Ever See! [00:00:30] Hey everyone, of course. Welcome to another episode of The Health Sessions. I am Guy Lawrence of 180 Nutrition just in case you’re hearing this for the first time. This is where, of course, where we’ll connect with leading global health and wellness experts to share the best, the latest science and thinking and empowering people to turn their health and lives around. This week we’re doing it with the fantastic Steph Lowe from The Natural Nutritionist. Steph has been gluten free for nine years. She has an undergraduate degree in sports and exercise science and she has a post-graduate degree in human nutrition. [00:01:00] I loved every moment of this podcast today and it was great to get Steph on and share her experience and wisdom across the years. Because essentially she’s in the firing line. She’s dealing with one-on-one clients all year round when it comes to sports nutrition, and more importantly, the topic that we get into today about combining low carb and real food and more of a fat-adapted diet to athletic performance. We make sure we cover the spectrum today, so from people that essentially could be living a sedentary lifestyle, to the weekend warriors or people that exercise, and then obviously to the high-end. We use crossfit as an example, but the high intensity, even then onto endurance athletes, and what’s the best way to go about looking at the way you will [fuel 00:01:23] yourself for maximum performance. [00:02:00] Even though if you’re not a high-end athlete this is definitely an applicable podcast for you. I loved every minute of it, like I said, and it was awesome to finally get Steph on the show to share all this stuff with you today. I certainly enjoyed it. I have no doubt you guys are going to enjoy it as well, and we’ll move onto Steph in a second. I just want to throw out there guys, don’t forget, leave us a review on iTunes if you can. Subscribe to us and five star us if you are a regular listener and if you are enjoying the podcast on a regular basis, because they do truly allow other people to find our podcasts and help them too. It’s a great way of, I guess, giving back a little for tuning in on a regular basis. I ask every week, and I’ll continue to ask, but that’s cool as well. Let’s go over to Steph Lowe. Enjoy. Hey, this is Guy Lawrence. I’m joined by Stuart Cooke. Good morning Stu. Hello, Guy. How are you? I’m fantastic. Thank you. Our awesome guest today is Steph Lowe. Steph, welcome to the show. Hi guys. Great to be here. Great to finally have you on Steph. I’ve been following you for a long time, and to finally see you on the podcast is great. Absolutely. The first question I got for you, Steph, which I’ve been asking everyone on the show is if a complete stranger stopped you in a cocktail party, say, and asked you what you did for a living, what would you say? [00:03:00] I would say that I’m a sports nutritionist and I run The Natural Nutritionist which is certainly an online hub where we teach people not only how to just eat real food, but how to optimize their metabolism for everything from the day-to-day activities up to being an elite athlete. [00:03:30] Yeah. Perfect. There you go. I’m curious as well, Steph, because I know, like I said, I’ve been following you a long time and I know you’ve had a social media presence for a while, and with your podcast as well, and even when the whole movement started with paleo and the no sugar sort of movement started to come along, and I think there was a period before that that people would think that we’re all mad going on about this kind of stuff. I’m curious to know like what was your journey, where did it start for you, and how has it been across the years and what have you seen within the industry. [00:04:30] I love this question, because I’ve been in the industry for a long time. I started working more in the gym space. My undergrad is in human movement, so I was working as an exercise physiologist. The reason why I stepped more into the nutrition space was because I had learned through that part of my career that there was a massive gap in educating people around nutrition, and how to keep it simple, but to break down those myths that we’ve seen in the nutrition space. I went back to study nutrition at a postgraduate level, but it was quite challenging because the curriculum is very archaic and driven by industry, and particularly in the sport nutrition space which was my passion, we were learning about carbohydrate loading and sports gels and these recommendations that athletes need to fuel off 60 to 90 grams of carbohydrates per hour. [00:05:00] I guess I just knew I needed those qualifications to be able to change the space. I committed to that degree, even though I had to study things that definitely were against my beliefs. [00:05:30] Yeah. Looking back it’s interesting because I get asked this question a lot by people that are perhaps wanting to follow a similar path to mine, and whilst we see some changes now with the courses that are available, at the tertiary level it’s not too dissimilar. You have to be willing to learn things that maybe aren’t what you’re going to teach or educate, and be able to separate what is real food, to what the myths and misconceptions have been over the last five decades. Yeah. How long ago was that Steph, when you started to study that? Just curious. [00:06:30] 2009 was when I went back to start my post-grad studies, and that was two years, so by 2011 was when I had transitioned into working for someone else to starting my company, The Natural Nutritionist, and to answer your earlier question, when I started that education people literally thought I had fallen out of a tree. Back in 2011 eggs were going to kill us and saturated fat was going to give us heart disease, so even in a clinic environment when I’ve got a single person in front of me wanting to learn about whether it’s simply real food for a family, whether it’s a fat loss goal, or whether it is an elite athlete trying to change their metabolism, like it was quite a challenging time because I was a myth buster. That was basically what my role was back then. [00:07:00] Yeah. There wasn’t many people. I can think back. There was, I think, Cyndi O’Meara was making a lot of noise at the time. I think we’d been only around about a year, year and a half at the same time when they’re starting to push this message out as well. Yeah. It’s fascinating. Sorry, Stu. I know you’re going to ask a question. How much of a transition has there been? Because you’re in the firing line. You see people one-on-one quite a lot, and how much of an acceptance do you think there’s been in the general public eye from then to all the way up until now? [00:07:30] So much. We’re in 2017, so we’re talking over the course of six years, but rarely do I have someone in my clinic now that doesn’t know about [inaudible 00:07:26] or even fat adaptation with my athletes. Most of the time it’s someone that’s really savvy that’s probably done their own either reading or experimentation, and they just want that personalized guidance, which is amazing, because our role is to optimize someone’s metabolism and to give them that knowledge, but it’s so much better when they’ve already come to that decision themselves. Yeah. It’s certainly easier to make the transition. [00:08:30] Interesting. You mentioned a couple of times, Steph, as well about metabolism, and that’s a word that everybody will be familiar with, and I know that Guy’s metabolism and my own metabolism are wildly different as well, so especially coming at if from the angle that you do. It’s kind of interesting because we’re all so wildly different. Tell me a little bit about the term metabolic efficiency because I’m intrigued to know what that actually means. [00:09:30] Yeah. For sure. This is my favorite term, so we talk about metabolic efficiency being that re-orchestration from relying on sugar as a predominant fuel to relying on fat as the predominant fuel. The reason why we use the term efficiency is because using fat for fuel is by far the most efficient way. We know that everybody can store up to 2000 calories of carbohydrate which is stored as muscle glycogen. You’ve got 2000 calories to fuel your exercise, for example, but even the leanest athlete if they weigh 60 kilos and they’ve got 10% body fat, they’ve got hundreds of thousands of calories of fat available. It’s far more efficient to be able to rely on those calories or that energy source, and so we teach our athletes how to do that with nutrition, training, and lifestyle strategies. Would that be every athlete? I’m talking about crossfit to ultra endurance, so wide range. [00:10:30] Yeah. For sure. We get asked this question a lot. Because our audience is largely endurance athletes and they are probably the athletes that can benefit the most from metabolic efficiency simply because of the duration. Two hours of muscle glycogen will fuel a crossfitter, and I’ll come back to that athlete in a moment. We’re talking about iron men athletes that are doing seven to seventeen hours and trail runners that are doing twenty-four hours, that if they rely on their glycogen, if they’re a sugar burning athlete they will hit the wall. We call that a nutritional bonk in Australia. Hitting the wall basically means that you run out of petrol. For an endurance athlete that’s a sugar burning athlete, that’s a game of Russian roulette. [00:11:30] It’s not a matter of if, but, when, when your duration extends beyond that sort of two or two and a half hour mark. For a crossfitter, crossfit is largely a glycolytic activity, so it’s high intensity. Being able to optimize your muscle glycogen is certainly a really important part of that performance, but what about if you’ve got a crossfit competition over the course of a weekend? If you’re burning through glycogen, the backend of your performance is going to suffer. Crossfit athletes can benefit from being efficient because that also means that you can burn both fuels. You’re not just over here burning fat for low intensity, you can come back and burn that sugar for the big lifts. [00:12:00] Certainly in a competition stage you can preserve your muscle glycogen by burning fat at the beginning of the competition or for the warm-ups and the lower intensity components, and then use that muscle glycogen where it’s needed most. If you’ve got a competitor that’s only burning sugar, but you’re efficient and you can use both fuels then you’re going to win because at the backend you’re going to have that fuel to perform, whereas your competitor is going to be starting to burn out if not hitting the wall. [00:12:30] I was going to add, because what I’m curious about is, Steph, is that then I would say or you can make it clear for us, but for that crossfit athlete there would be months and months of preparation for him to become metabolically efficient in that way, to be able to then perform on that. I’m guessing it’s not just about just switching the diet leading into the competition. My question would be is how would you transition to become more metabolic efficient from being a carb burner to more of a fat burner? How long can that transition take with people to really see the benefits of that? [00:13:30] It can take eight to twelve weeks. As I mentioned there’s nutrition, and training, and lifestyle strategies that create that metabolism. In general crossfit athletes are in a much better position because of that link between paleo and/or real food. Hopefully most crossfitters aren’t following a standard Australian diet. The main changes that sort of an athlete will need to do is to move around their carbohydrate consumption. This comes back to what I was saying before about the types of exercise, like we teach our athletes to marry their exercise intensity with their macronutrients, and what I mean by that is that if you’ve done aerobic activity underneath your crossover point, which I’m sure we’ll talk about a bit later, that exercise should be fueled on fat, so you don’t have a huge carbohydrate requirement post-training. [00:14:30] Your food should be more non-starchy veggies, quality proteins, and good fats, whereas if your exercise is higher intensity, so above that crossover point, you need carbohydrate. We would prioritize the addition of complex or starchy carbohydrates in that post-training meal. A simple example is a banana or a sweet potato included with that meal that has non-starchies, proteins, and good fats. The crossfit athlete who might be relying on lots of carbs with each meal needs to move it simply to post-training and/or pre-training if it’s a high intensity session that they feel like they need extra fuel to support, to optimize. Yeah. Perfect. It’s about timing. [crosstalk 00:14:39] is when you eat your carbs. That’s right. I think when Guy says weekend warrior he’s very much talking about himself and me included as well. That’s kind of exactly what we do. [00:16:00] Great question, and I want everyone to remember this: your carbohydrate intake should be relative to your exercise intensity. If you’re sedentary you need very little carbohydrates. A weekend warrior will start to scale up prioritizing the consumption of whole food carbohydrates post-high intensity training, and then obviously will continue to scale up with more intensity included. 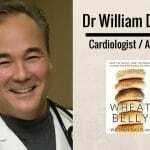 That’s really important to think about, because our approach is always about real food, but we call it LCHF, lower carbohydrate, higher fat, but we have a spectrum that is relative to the individual. [00:16:30] What I mean by that is someone that’s got type one or type two diabetes, someone that’s very metabolically damaged, obese, or very sedentary may only need to consume 30 or 40 grams of carbohydrates a day, but you and I that have lots of general activity, elements of high intensity will probably sit somewhere around that 60 to 90 grams of carbohydrates, in general about 15 or 20% of your daily intake, and then the spectrum continues. LCHF goes up to 150 grams of carbs a day, so nowhere near our food pyramid’s 6 to 800 grams a day, but very much adequate carbohydrates for the athlete or the individual that’s got that higher output and certainly higher intensity in their training. … well is it half a sweet potato. Yeah. That’s right. 150 grams of carb a day. What are we looking at there? … the fats that have that small amount of carbohydrate as the macronutrient breakdown. [00:18:30] Yeah. Brilliant. What about the fat intake then, because obviously we qualify the fats first of all. I just want to make that clear for people because there are good fats and bad fats, essentially. Do you vary the amount of fat to suit the exercise demands of the person as well, or do you generally keep that the same for everyone? [00:19:00] It will change in the day as well, and this can kind of think … We can summarize what we’re talking about here is that our nutrition should be periodized over the week. I think we’re all guilty of either wanting to follow a meal plan or just eating the same thing every day, which when we really break it down doesn’t make sense. I mean we’ve got such different levels of output on each day. Some days I might just do a walk or a yoga class, and then other days I might be going for a fartlek run like with intervals and spikes in the heart rate, so you’ll need very different amounts of food or macronutrients at least across those two days. If we have got a day where we’re doing higher intensity then we know that day is going to have higher carbohydrates. [00:19:30] You’ll probably find that you’re doing a simple swap, slightly less fat, slightly more carbohydrates, because you don’t want to do high carb, high fat because your overall intake will be too high, and then it actually does come back to calories. Does that make sense? We have a- … Go on. No. Go on. Sometimes it needs to be simple for people just to get them actually eliminating those inflammatory foods in the first place before they even start to put too many barriers in, because I find even as a fitness trainer when you’re starting out if you got people to count initially, I always used to find elimination would help first of all, and then if they want to get more detailed they could go in from there. Yeah. I think people need that information because we don’t often talk about calories because we’re really trying to continue to break down that calorie fallacy that we saw through the last five decades, but you can still eat too much food. With an example that we get everyone to start with, of course, we want to personalize nutrition, but in terms of a little formula that we use here at The Natural Nutritionist, we get everyone to try and have two cups of non-starchy veggies with every meal, so even breakfast which can be quite a challenge for those people that are coming off a standard Australian diet. They think you’re crazy by getting them to eat vegetables in that first meal of the day. 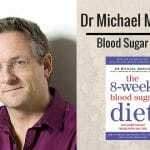 That can make a huge change to obviously nutrient density and blood sugar control. [00:21:30] Two cups of veggies, then we add a palm-sized piece of protein, so that’s where it can be quite relative, because we’ve all got different size hands. In terms of weight though it’s usually 120 for females, 150 to 180 for males depending on activity levels. Then one to two portions of good fats with each meal. A portion is something that give you 30 grams of fats, so 30 grams of nuts and seeds, 30 mils of olive oil, 30 grams of grass-fed butter. You’re looking for one to two with each meal. Then how we teach our athletes to continue to be intuitive with that, as you said, Guy, is to use their satiety. We want satiety and by that I mean that feeling of fullness that you get after a meal, we want four or five hours of satiety for each meal. Yeah. It makes complete sense. Yeah. If it’s not then you can scale your meal up a little bit. If you eat that two cups of veggies, one protein, and two good fats, but you’re hungry in three hours all you need to do is go back and add slightly more non-starchies, touch more fat, and you will extend your satiety out to five hours or more. [00:23:00] Perfect. No. That’s great. I’m just thinking about to become truly metabolically efficient and transition to use fat for fuel, do we need to go as deep into ketosis to do that or can we skirt around it? [00:23:30] Great question. I think ketosis is excellent in terms of its therapeutic benefits, and it can suit those that certainly have that metabolic dysfunction. Great for at least the initial phase of healing type one or type two diabetes, but I’m not a massive fan of it long term. I think we can benefit from maybe two weeks of ketosis, viewing that as being like a foot on the accelerator to optimize fat burning, but if you’re doing high intensity exercise you’re going to need whole food carbohydrates. [00:24:00] Some of my athletes use it occasionally throughout their build, for example, if maybe they need to fine tune things or shift some body fat. I try and prescribe it in short bursts, again, looking in that periodization in line with their training. Okay. Understand. What type of baseline tests would you historically perform on an athlete or Joe Public when he walks in the door and says, “Look, I just want to be better at what I do.” Where would you start? Would you go into bloods and things like that? [00:25:00] We ideally like to have a comprehensive pathology for all of our clients. It’s a little bit limiting unfortunately with Medicare these days, like they’re cracking down on the amount of tests that can be approved. Most of my clients are also happy to bridge the gap and pay for what’s not referred under Medicare by their GP. Hopefully times will change. We start with bloods, and the reason being is because it can be a great before. You want to have a look at where your health parameters are and obviously be able to track that because things are really individual. When you’ve got that reference range to use three, six, twelve months later it’s far more efficient than using an outdated norm that’s based on sick people that go to doctors over the last few decades. We try and avoid using those references ranges. We have our own optimal goals because we’re looking to optimize our health, not just not be sick which is what those reference ranges do. [00:26:00] Bloods are great, but also from a supplement point of view, like I mean obviously there are some key supplements that we can prescribe to everybody, but in terms of how we continue to personalize that, that’s going to come from your pathology. We’ll prioritize real food where possible, like, for example, with things like iron and ferritin. If someone is moving towards anemia I wouldn’t start with an iron tablet. I’d have a look at what they’re eating first, but there is a place for supplements in many people’s lives, but I try to look at their pathology wherever possible so that we can prescribe and then reassess. It might not be something they need to take forever, so we can retest their blood and continue to evolve that protocol moving forward. The transition, so for people listening to this thinking, “Right, I want to become more metabolically efficient. I’m going to start stripping back my carbs and increasing my fat.” You mentioned it takes about eight weeks. Is it difficult? Do people struggle with it? What are the common mistakes people do? There’s a few questions in there. Yeah. For sure. Yeah. That’s great. I mean the amount of effort or the difficulty is definitely going to be relative to where you’re starting from. If you’re starting from a standard Australian diet or an athlete that’s been following those carbohydrate guidelines that I mentioned at the start, then we can definitely say that you’re a sugar burning person or athlete. Then what’s going to happen is that in week one we basically cut off your fuel supply. We significantly lower the carbs and get rid of all the refined sugar, and you’re now a car that has no petrol. It takes about four to seven days to be able to access fat or that diesel engine. Those four to seven days can be challenging. There’s detoxification symptoms like headaches, fatigue, cravings that can definitely occur. [00:28:00] Certainly some people find it really hard to manage their appetite initially because they’re also used to eating so often, so starting to decrease their meal frequency takes time to adjust to. Four to seven days is a pretty short time to then experience all the amazing benefits that real food and an efficient metabolism creates. There’s strategies we can do during that time though, like for my athletes they won’t do it in a peak training week or when they’ve got a race around the corner. They’ll definitely do it, one, in their off-season, or two, in a recovery week at least, so they can drop their intensity right down. Then they don’t need those extra carbohydrates to fuel what training they’d be doing in a peak week, for example. … pretty unpleasant and something would be going [inaudible 00:28:40] if that was the case. [00:29:00] Given your focus on athletes as well, so have you got any particular strategies around recovery? Because I know that it’s a bit of a rabbit hole when you talk about low carb high fat, and the purists there are the keto-adapted warriors that munch on a block of butter. I’m thinking that you really want to access these beautiful nutrients across the board when you’re in recovery because your body is just wanting all this stuff, so you’d want to perhaps put the butter aside a little and start to tap into some other channels there. What would your strategies be then for recovery 101? If it’s an individual that’s just starting out, the biggest thing they can do for their recovery is eat in the hour post-training. It doesn’t need to be straight away and you don’t need to rush because when you’ve just finished training the blood flow is going out of the digestive system to the heart and legs and lungs and into that recovery process, so putting food in too soon can detract from that. We know that we want our digestion to be in that parasympathetic rest and digest state so that we can optimize our digestion and absorption. An hour is pretty appropriate for most people, but you will notice I always say non-starchy veggies first. That’s deliberate. [00:31:00] Non-starchy veggies, quality protein, good fats, and then complex carbohydrates if it’s been a high intensity or a particularly demanding session. Back in the days of Atkins and this is where I think some people are still a little bit afraid of LCHF, unfortunately, is that it was just chunks of meat and buckets of butter. We’re trying to obviously move away from that myth in the LCHF real food space, because plant materials should be the base of every meal. That’s where we get our vitamins and minerals and nutrients and antioxidants, and that’s going to get rid of those free radicals and really kick start that recovery process. As you guys will know, protein has been that poster child in the recovery space, but it’s not just about protein. We need protein. We need quality protein whether that comes from grass-fed whey or some free range eggs or whatever that might be, but it’s about that combination of nutrients, so good fat for satiety so that recovery meal isn’t just going to keep us full for one hour. We’re going to get that five hours out of it, and then carbohydrates for muscle glycogen replenishment if the session has been glycolytic in nature. Another question that popped in there, Steph, is that if let’s say somebody has taken the time, they’ve transitioned from being a carb burner to more of a fat efficient metabolic burner, and how long would it take them to knock it out? If I said, right, I want to put myself to being back a carb burner, like are you talking about a couple of days if you just let go and just gorge or is it weeks or what have you seen over the years? It’s interesting. It really depends on what stage of the journey you’re at. If you’ve just started, let’s say you’ve just started for seven days and you’ve gotten past that metabolic gray zone where you’re feeling average. You’re starting to feel good. You’re eating three times a day or less, and then you start smashing the carbs and sugars, you can get back to day one pretty much straight away. Because we know that carbohydrates and sugar in excess will spike that fat storage hormone, insulin, that blood sugar rollercoaster then continues or starts again, and the viscous cycle. You just go round and round in circles of needing food all the time, and then hungry and having cravings and so on. [00:33:30] It can definitely be reversed quite quickly when you just start, but the best thing about being efficient and say you’re eight weeks in is that you not only can burn fat, but you have a really improved carbohydrate tolerance. If you add in extra carbs you actually often don’t get that huge spike and blood sugar rollercoaster. Your body can tolerate that fuel more efficiently so the impact of that can be quite negligible. One of the first athletes I worked with, we totally transformed his metabolism. He went from having a really low crossover point, heaps of carbohydrates being utilized at even low intensity exercise. His crossover point then went far to the right. He was burning heaps of fat, and then he was going to Asia for a holiday. [00:34:00] He was a little bit concerned. He was like, “Steph, what’s going to happen when I start eating all this rice? I want to have this holiday with my family, and I don’t want to be stressed and having to carry my food everywhere.” I was like, “Don’t do that for a start, because food is definitely to share and to enjoy.” We definitely don’t want to be obsessive at all. I just said be mindful of your portion. You don’t need any more than half a cup of carbohydrates at any meal. Make sure you’re following our non-starchy veggies, proteins, and good fats, and have a holiday. Have a good time. Long story short, he came back. Within two days he was back on his smoothies and his omelets and all of his beautiful grass-fed proteins, plenty of starchy veggies, and it was a blip on the radar. Nothing happened. His satiety was great and his performance was excellent. It was, I think, a really good break for him and also some good evidence as to where his metabolism had got to after that initial eight week period. No. That’s the thing. We get a lot of athletes or even our weekend warriors, their goal is fat loss, for example, but that’s not necessarily something you see straight away. You’re not going to get to goal weight next week, but what you are going to feel almost immediately is that you have control of your appetite, your blood sugar is stable, you’re not having any cravings, you’re not hungry anymore, you’re not needing to eat every two hours. So many amazing benefits that it’s life changing for most people. They’re blown out of the water as to how different they can feel by eating real food and managing their carbohydrate intake. [00:35:30] That’s a great incentive. I’ve probably met about one person in my entire life that doesn’t like things like bread, so it can be a little bit challenging to be told that that’s not an everyday food anymore, but the benefits that you feel outweigh any of those foods that you perhaps once thought were healthy. Totally. Common mistakes, so where do people typically go wrong with this? Yeah. I think that probably the biggest mistake for someone starting out is still that fat phobia. A lot of us have been around and counted calories and looked at our intake versus our output, so to give someone the freedom to eat 60% of their daily intake from good fats can be so overwhelming, and a lot of the time even though they’re given that license they can’t face eating that much, at least straight away. The mistake then is if you go low carb and low fat, what happens? You’re eating like 1000 calories a day and you’re not getting all those benefits. You’re definitely not getting the satiety, and neither are you getting enough nutrition. There’s an education process and it’s why we love working with people one-on-one, because it’s a process. [00:37:00] I don’t expect someone to go from low cal, low fat to being comfortable eating 65 or 60 to 65 grams of fat a day, sorry, per cent fat a day. We can generally evolve that process and get them more comfortable, teaching them that it’s a real food source so they can start to see how it must be healthy because it comes from nature. It’s not out of a pocket or a box. That’s probably the biggest mistake. Yeah. No. It makes sense. [00:38:00] It’s interesting as well, because we have just been indoctrinated into this low fat dogma for so long. It’s so deep-seated and ingrained in us, but I’d had a blood test about six months ago after a friend of mine said, “Jeez, you were eating so much fat, like this is just crazy. It’s not healthy.” He saw me making my smoothies where I’d put in half a can of coconut cream and a whole heap of nuts and half an avocado and some coconut oil. That was just a smoothie. I went to a good friend of ours, a naturopath, and ordered my blood work and it came back, and this was after a good 18 months of really ramping up the fat, and everything was 100%, like inflammatory markers were virtually non-existent, and all the levels were looking really, really favorable. It’s trying to let go of old science, I think, and just adopting the new rules. [00:38:30] Yeah. For sure. The most inflammatory food is or are refined carbohydrates and sugars. If you’re wanting to be anti-inflammatory and control things like your blood lipids or at least your trigs or triglycerides then you want to be eating anti-inflammatory foods, and now omega-3s and saturated fats are amazing for those heart health benefit. It’s just really, really challenging for someone that only knows low fat, and particularly the real sort of dogmatic messages with that saturated fat heart health myth. That takes time to undo. It still blows me away how we got it so wrong. but 50 years from now. No. That’s right. What on earth are we doing? It’s funny, in the early days of manufacturing our own products we applied for the heart tick of approval and we were declined because there was too much fat in our products. Do we want to open this can of worms? It’s nuts, isn’t it? I think at the time the heart tick was on about 60% of all McDonald’s menu choices, so it’s kind of funny where it comes from. We live, we learn. [00:40:00] Yeah. It’s a huge part of the problem in Australia, I mean we see it with The Heart Foundation and we work with a lot of diabetics and we see it with The Diabetes Association of Australia. It can be so challenging for someone that’s been told X for so long to get their head around that that was wrong or is wrong. Yeah. We see it all the time. [00:40:30] Absolutely. We’re fixated on the body as well, the weight, so, “Oh, well, you know you’re overweight. You’re underweight.” I’m always concerned about what’s happening up top when we deprive ourselves of all these valuable nutrients to our brain. How does that fare when it’s so dependent on all these beautiful nutrients that come from different fat profiles? It’s scary to think [crosstalk 00:40:33]. Absolutely. We see that with the huge terribly tragic influx or increase in Alzheimer’s through that low fat era. Yes. Absolutely right. It’s nuts. Yeah. Boy oh boy. [00:41:00] I’m going to change gears because time is getting on, and I want to ask Steph this because I know clearly you’ve got your nutrition dialed in, I’m guessing, so your exercise routine, what are your philosophies around it or what do you do in a typical week for yourself? [00:42:00] I have a background as being a long course triathlete but I’m having a little break from anything endurance-based at the moment. I am doing a lot of high intensity interval training, so probably about four or five sessions a week that are just 28/30 minutes in duration. I really enjoy that type of exercise, like fully body high intensity. Then a lot of yoga, a couple of runs and lots of walking. At the moment I’m just trying to be really aware of my activity. I’m sitting down now, but standing up at work and things like that. I’ll probably go back to long course eventually, but in terms of my focus now it’s more on strength and just working on my metabolism in terms of real food, and I still do fasted training to help with that fat adaptation, but slightly different to what my athletes are doing at the moment. [00:42:30] Fantastic. 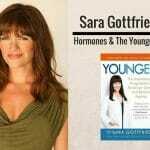 From myself working in the fitness industry for so long, I mean females generally would be terrified of strength training, I found, a lot of them until you could get into that it was such a critical part of actually just for your health now, you feel, let alone getting bulky or putting on weight or whatever the myths seem to be. That’s fantastic. Another question, what did you eat yesterday, Steph? We did some pumpkin and feta. No. Pumpkin and zucchini fritters for breakfast with some eggs and mashed avocado. Then didn’t really eat much after that until dinnertime yesterday. Did I? I might have had like a long black. Then for dinner last night we had a roast veggie salad and with some slow-cooked lamb. Perfect. That sounds amazing actually. That’s what they say isn’t it? Keep it simple. That’s what our grandparents used to do, and it seemed to work for them. 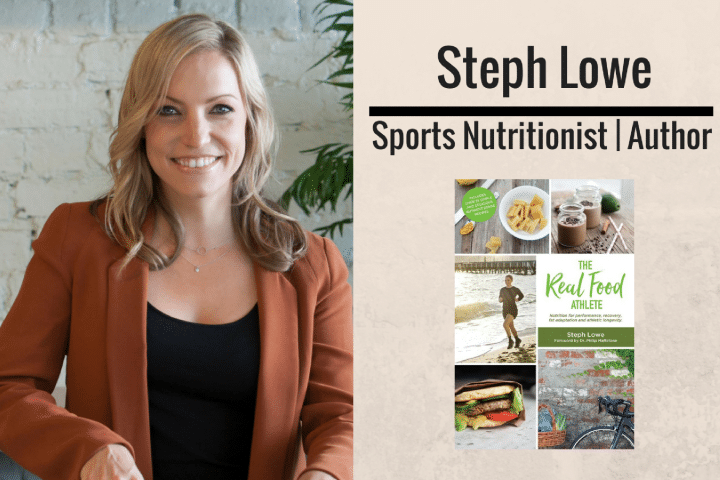 I want to talk a little bit about your book, so you got a book: Real Food Athlete. Can you tell us a little bit about that and what can we expect? I’m guessing that all of your knowledge is crammed in there and it’s going to be a real gem. Yeah. Absolutely. Thank you. The Real Food Athlete is all about nutrition for performance, recovery, fat adaptation and athletic longevity. It has a lot of the tips and tricks that we’ve discussed today in terms of how to transition to a real food lifestyle, but definitely all about metabolic efficiency. 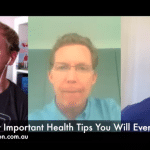 We talk about the benefits of that sort of metabolism, what sort of athletes it’s appropriate for, and certainly the reasons why, so that we can educate people of the negative impacts of relying on that sugar burning metabolism. Lots of education around that, but there’s a big part of The Real Food Athlete that’s super practical, so how to change over your kitchen, what sort of ingredients you will be using and why, and then over 75 real food recipes. [00:44:30] We have lots of different sections from our main meals, but also real food sports nutrition. We teach a lot of our athletes around what they can make themselves to fuel things like a crossfit comp or a long ride, or even an iron man from a race point of view. There’s a whole chapter on that as well, so we can move away from our refined powders and sports gels. Brilliant. If I wanted to grab a copy, where would I get it from? [00:45:00] The Real Food Athlete is available online at thenaturalnutritionist.com.au. We just post that out from us, our clinic here in Melbourne. There are a couple of distributors around Australia, but mostly available online at this stage. We’ll obviously keep working on getting that around Australia this year as well. Congrats on the book. Yeah. Look forward to delving into that one. … how much work has gone. [00:45:30] Before I get into the last question, Steph, just something that popped in there, because we talk about stress quite a lot on the show and no doubt you keep yourself fit, healthy. You’ve got a very busy practice, and I’m sure it gets stressful sometimes. What do you do to relieve stress on a daily or weekly basis? [00:46:00] Yoga is definitely my release. I think that was another part of why I moved away from triathlon for the short term is that my business has exploded in the last two years which is amazing. I just didn’t have the time to dedicate to doing iron man, so like short and sharp training was obviously allowing me to find that balance again. Yoga, I mean I would do yoga every day if I could, but I’m probably doing it three or four times a week. I just really like that time out, that hour to have guided breath work and movement, and obviously mobility and all those amazing benefits. I try to do a little bit of meditation, although I definitely don’t do as much as you Guy. It’s something that’s a work in progress for me. [00:46:30] I guess it’s just the awareness. I try and really do things like schedule my day quite efficiently so that I can have time out, and structured time for a walk, and meal breaks, and just the little things that make all the difference to how you feel at the end of the day and at the end of the week. Fantastic. Fair enough. It’s just being organized a bit, isn’t it, and allowing yourself to have them little bits of time out, whether it’s even 20 minutes here and there or being able to do that. Yeah. [00:47:00] Particularly for meals, you know like I said before about that rest and digest, if you’re stressed and trying to eat lunch and answer emails or whatever it might be, you just don’t get the optimal digestion and absorption, and it can lead to overeating and lots of absorption or digestive complications. I used to be really guilty of doing that, whereas now I sit and try and eat mindfully or go down and sit in the sun, and just allow that time so that my body is primed for nutrient absorption and uptake. Steph, what are your non-negotiables to be the best version of yourself? [00:48:00] Great question. I mean real food is number one. I know we talk about it all the time, but I just think people think that it’s either it can be challenging or it’s expensive, or they kind of waiver in and out of it, but I guess I’ve just found a way to make it a lifestyle no matter if I’m traveling or working, or away for the weekend. I think it’s comes down to just always remembering the benefits and that that will outweigh any cost or preparation time that needs to be allocated. I rarely deviate. I mean I teach my clients 80/20, so there’s like a 20% balance, but my idea of deviation is probably some raw chocolate or maybe occasionally I’ll have a gluten-free pizza, but not weekly or anything like that. [00:48:30] I guess I just know how I feel when I live that way. That’s something I’ve definitely prioritized. Daily movement is a non-negotiable. I actually can’t start my day with some kind of movement, even if it is a walk on a recovery day. As I mentioned with metabolic efficiency the training fasted is a huge way to start to create that, whereas a lot of people are always used to eating a banana or an Up & Go or something like that before training, which means they only burn the food that they’ve eaten. They can’t teach their body to access their fat stores, so that’s something that’s non-negotiable for me each morning. [00:49:00] Then it’s balance really, balancing things like getting off social media and setting up your nighttime routine so that you’ve got a nice dark room and no extra stimulus so that you can look at that rest to balance everything else out. That yin and yang I guess. … similar themes. Yeah. Exactly. It’s doing the basics well, isn’t it? Last question, what’s the best piece of advice you’ve ever been given? [00:50:00] I think it’s really important to have a career that you love, like I’ve experienced the opposite before I started my company, and I can’t tell you how life changing it is to be able to wake up every day and do what I love, and now I have the option to provide employment for other people in my industry, and if that was available to me when I finished studying it would have been an absolute dream. I’m just really passionate about helping others find or be able to do what they love. It’s not always easy to change careers. I’m not saying that. I think it makes a huge difference to your health and wellness if you can find something that you love and make a living out of it. Anyone listening to this where’s the best place to find out more for Steph Lowe? [crosstalk 00:50:13]. [00:50:30] Beautiful. Our online hub is the naturalnutritionist.com.au. Definitely head over to the website. We have what we call TNN’s team, where you can subscribe for weekly articles, recipes, performance tips, and giveaways, so certainly you can become a part of our community by adding your name and email address at the website. We’re very active on social media. All the handles are The Natural Nutritionist, Instagram and Facebook. We’re not that active on Twitter, but all the links do go there anyway. Just definitely stay in touch that way. We love hearing from our audience, and we’re more than happy to answer any questions that you guys have. We will share your links galore in the show notes, which will be great. [crosstalk 00:51:01] certainly push as many people, because your message is fantastic. Thanks for your [crosstalk 00:51:06] show. … acknowledge all the good things you do. Been following you a long time and it’s great to have you on the podcast today, Steph. Thanks for coming on. Really grateful. Awesome to chat guys. Thank you. Thanks, Steph. Speak to you soon.